Taken from their 1986 album True Stories, which also served as a “soundtrack” to the David Byrne film of the same title, New York’s rocking Talking Heads took their last top 40 single to #25 during the fall of that year. It is notable for winning Best Group Video and Best Video From A Film at the 1987 MTV Video Music Awards. (Remember when MTV played music videos?) It also went top ten in Ireland and New Zealand. A cover by reggae group The Wailing Souls hit the Alternative chart in late 1993, but failed to enter the Hot 100; it was featured in the film Cool Runnings. As I mentioned, three songs with this title entered the Hot 100, two in 1988 and one in 1999. The first was by rapper Kool Moe Dee, who took his song to #62 in May. It was his first of two top 5 singles on the R&B chart. 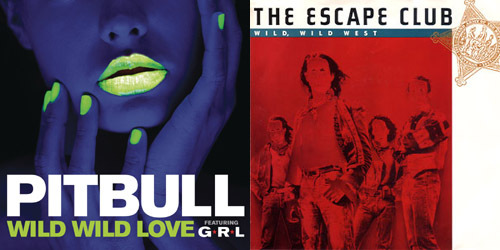 A few months later, British rockers The Escape Club scored a #1 hit with their debut single for Atlantic Records. Both it and the album (of the same name) went Gold. Lastly, there’s rapper/actor Will Smith; his hit from the film Wild Wild West sampled Dee’s song and Stevie Wonder‘s “I Wish”. With Dru Hill on the chorus, it spent a week at the top in July. Which one of these winners is wild enough for your playlist? Let me know! Follow the blog by using the tab below or find PGTC on social media by clicking the “Get Social!” tab at the top of the page. After hits like “Dream Lover” and “Mack The Knife” the previous year, Darin charted with this around the holidays, which was the same melodically but with altered lyrics to create a more Christmas-themed record. The result was just a minor entry on the Hot 100, but he would be back in the top 40 a few months later with a cover of “(Up A) Lazy River”. Singer-songwriter Fogelberg’s first single from The Innocent Age was another of his tender ballads and went as high as #9 on the Hot 100. The song is based on the performer’s chance meeting with an old girlfriend on Christmas Eve in 1975. Most stations only play this song around the holidays nowadays, but truth be told, “Same” actually peaked in February. Kenneth Gorelick made a name for himself with his saxophone in the 80’s and 90’s, and this rendition, which was mixed in with audio bits of significant 20th century events, was big. The album version ran almost eight minutes, and the edit was just under five. I heard this mix on the radio a total of one time, and that was one more time than I needed to hear it. 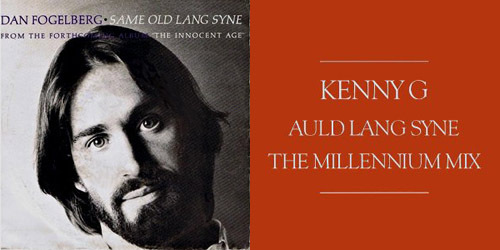 Beyond these three songs, there are a number of other songs that name-check “Auld” in their lyrics. One of the biggest came in 1999, when Will Smith rapped, “Get ready to hum “Auld Lang Syne” / ‘Cause a person that know the words is hard to find,” in one of his last top 40 (#25) hits, “Will 2K”. Plus, with many more covers from acts like the Beach Boys and Mariah Carey, you can get your fill and then some. Just consume responsibly. Happy New Year to all you PGTC readers and see you in 2014!